It is the first time for very long that I write a review with lyrical digressions, thoughts and market observations. The product that prompted telling so much is significant and is a kind of a milestone for the company and the whole mobile market. In some way such words sound too pompously and are more suitable for press releases than for an ordinary review. But only two-three phones a year make you forget everything and "play" with them for long, they really attract from the first minutes. 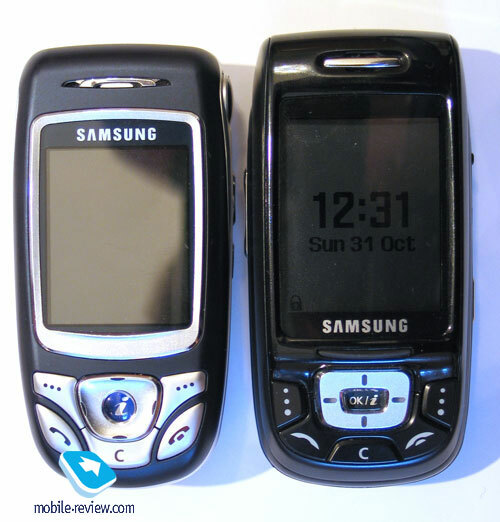 None of the phones of 2004 may compete with Samsung D500 in its power of impression and emotions. So, you'll have to be patient and try to read everything below. I'll note that as for me ideal phones do not exist and D500 is not an exception. But this model is the closest to the ideal mobile phones but not a smartphone. Let's try to understand what made the company create the device now but not a year earlier. For years Samsung had been attracting people with a vivid screen, good polyphony, unordinary for a European market design. The company created its name on such products; the main bulk of impact was clamshells and then after a model with customary forms appeared. Against a background of Samsung other Korean manufacturers grew and a peculiar mobile manufacturing fashion was formed in the country. Just look around how many models by Korean manufacturers may be found in the market. 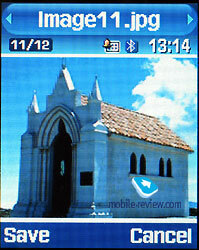 There are LG, Pantech, Innostream, Sky (now only CDMA, but GSM terminals will be available next year). There is no such a great amount of companies manufacturing similar devices in other countries, the only exception is Japanese market but this is a peculiar case. The fact that is not wide known is that many Korean companies manufacturing phones employ engineers that started working for Samsung and let alone marketing positions, there is a mass of them. The company starts forming the market in some kind and turned into a global gamer that creates tendencies, forms style. This fact is not still realized by many of the market gamers. In February a leader of one manufacturing companies told his opinion on a phrase that Samsung will soon dominate in the market. In short he told that Korean manufacturers might offer only outer shine but functionality would remain low for years. Let me even cite him: "They do not have that amount of patents as we do. But the matter is not even patents but the potential of our engineers, our team creating products and promoting them. It's impossible to create production of high-tech models that will be leaders for today from nothing for some years, it takes dozens of years. Understanding the demands and wishes of usual customers is necessary and today we are those who form the style for mobile phones, though Samsung tries to play this game. This is a weak position, selling beautiful cover empty inside". I couldn't agree with the opponent's arguments then and still can't do it now. To understand the company's development one should exactly know what it is producing now and what for. Average person will show their knowledge and will certainly name such goods as mp3 players, washing machines, TV sets. The one dealing with IT will remember memory production and really the company is one of the leading in the world market. But the list is not finished with these points, the company also produces matrixes for PCs, mobile devices, processors and various micro electronic devices. Today there is no any manufacturer in the market that could apply its own componentry so much. Its rivals have to buy that componentry and sometimes do not even have any choice. Do not get surprised having known that your phone by European manufacturer is equipped with a screen by Samsung, these screens are bought in great quantities. Technologies for sale do always differ in worse characteristics from those applied in own products. No doubt, a customer may get the newest screens (the ones left) but the price will be extremely high. Inside the company the price for them is minimal and that allows decreasing the price of its goods. The margin of a number of high price devices may exceed 100 per cent (from the price of manufacturing the phone and R&D expenditures). 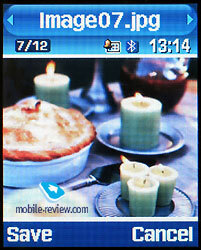 No any manufacturer may boast with such results and what is evident even Samsung does not demonstrate them in public. Permanent increase of the market share of the company in Europe shows the chosen way was right. The task of the first step was done, the company is an absolute leader in a fashion segment and in various price segments the company controls from 15 to 55 per cents of the market. Increasing the market share by offering more similar products seems impossible, it is already close to the maximum. The second stage also seems easy, it is to offer a model with characteristics of the same level with the best rival phones but using all the technologies applied in fashion devices. That is natural that own element base is used in this and all the following models. That allows to gain high sales and attract new customers who were not satisfied with the functionality of Samsung phones earlier. This segment is new and not investigated for the company because Samsung has never had business phones yet. 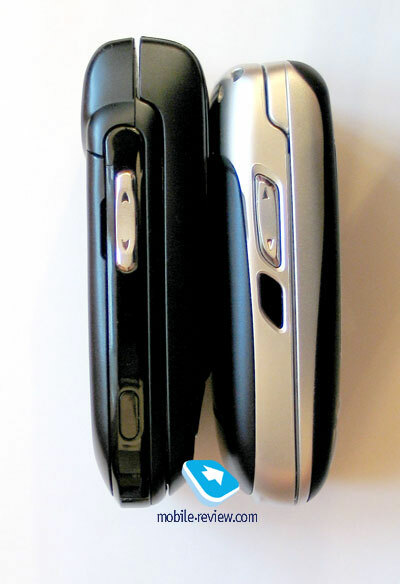 The absence of business phones was in some kind forced and caused by technical gap on the first stage. The company tried to set its positions in the business segment but couldn't provide a necessary number of functions. The release of the Q series may be called one of the most significant attempts, Samsung equipped its phones with batch communications (GPRS) for the first time then. The presence of IrDA and special software allowed to use the devices as modems for notebooks. But the projects happened to be unsuccessful and were closed very soon, low demand was the reason and business users preferred solutions by Nokia, Siemens, partly Motorola and Ericsson. Low popularity of the company may be named as one of the reasons. Before the Q series the company offered single business solutions but all of them were too plain and were not accepted as business phones by general public. Just that time an opinion that Samsung phones are just beautiful shallow devices was formed among the target group (businessmen) and many others. They impress with the sound and colours but are empty inside. The company didn't try to struggle with this name and only increased the production of fashion devices and widened their functionality. In some time the company realized that the fashion segment was too small for it and it was dominating there for that time The expansion of its product lines was necessary otherwise the market share couldn't have been increased. Thus middle-class segment was chosen as the one for development. 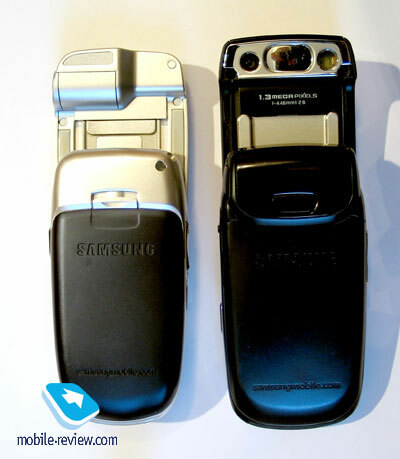 And Samsung С100 was introduced in 2003. It became the most powerful offer in its class. 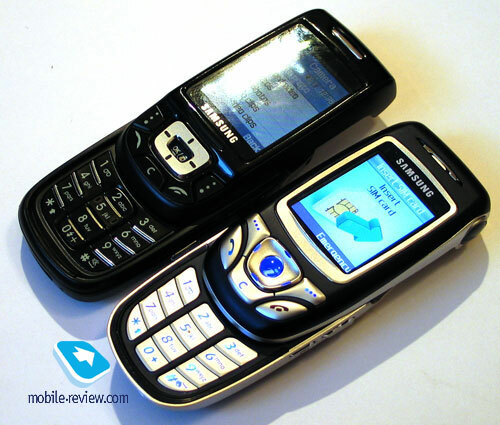 Samsung considered Nokia's products on the 40 platform to be the rivals. 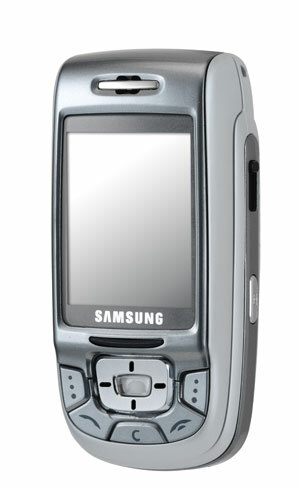 In a year the sales of Samsung C100 got equal to some products by Nokia and that was a real win. Then just a matter of technique, the expansion of the offer by Х100, Х600 and playing with prices. It is possible to say that having opened the door of this segment with C100 the company then entered there entirely. We'll remember this later when discussing the development of the business line. 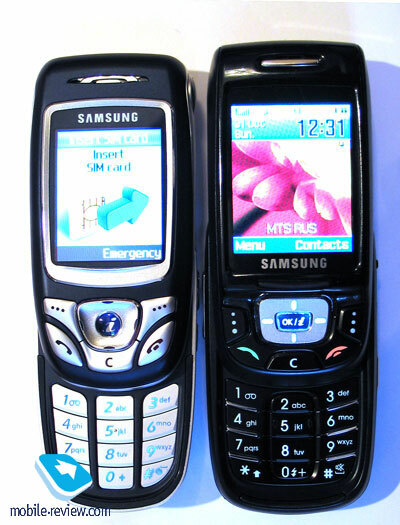 By the end of 2004 Samsung haven't had its products in two large market segments - low-end and business ones. As for the margin the business segment is the most profitable, though the sales quantities are not as great (the ratio for these segments is 90 to 10). Earlier the company announced the release of low-end products to the market (about 70 Euro in retail) but later it decided to focus on the functional segment. It is the only serious disadvantage of the company in the product line, even smartphones do exist but are not manufactured since the low market capacity. Development of a business phone is a durable process and that was true for D500 also. The device was worked out for a year and it was to head the line and remain the leader for a half of a year. The main task was to provide full functionality of all the integrated applications and communicational means (IrDA, Bluetooth). 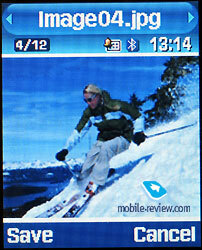 The products by Sony Ericsson served as a secret reference point. The developers compared the realization of these or those functions, the comfort of their use and offered their own solutions. I'll note in advance that the experience happened to be very successful and the device has its own bright peculiarity. Slider was chosen as a form-factor because it gets more and more popular today. The company doesn't make its users choose classical forms and offers ones different. This is a different to European manufacturers approach. Let's remember Siemens S65 and SL65. 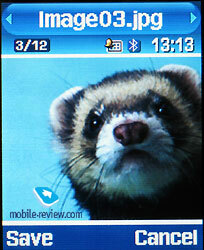 Fashion slider SL65 differs from its prototype S65 in a smaller screen, worse camera and the absence of bluetooth. That means the main component of the price is fashion and style and functions. In the case of D500 the approach is completely opposite, the device is to offer the latest capabilities in he most popular body. That is why the company didn't make out a new segment for the product and offers it as a Trend Leader. Skeptics or conservative ones may object that D500 can't be referred to the business segment reasoning from its form-factor. That is hard to object also and everyone has the right for a controversial opinion. As for me business users do already work with clamshells and phones of other form-factors. The main factors for the choice are functionality, brand and design. The manufacturers provided two colours, they are black and silvery. Both the colour solutions look strict, though the light one is more aerial. I admit that the black one looks very stylish and is suitable with any clothes and in any situation. In its body size D500 is close to E800/E820 but is a bit larger (93.5 x 45.7 x 23.5 mm). This difference allows saying that the phone is intended for men more that for women. On the other hand the difference is clear only during a straight comparison and in a girl's hands the device looks rather nice. The dimensions got more comfortable and the weight is typical for its class (99 grams). The changed size allows opening the device more comfortably in difference to E800, a mechanism of automatic finishing works well. There is a rubber cover on the front panel and a finger is set against it when opening the device. 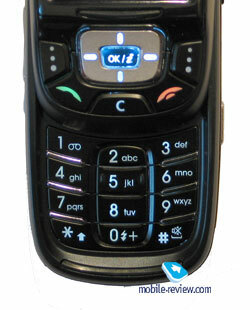 Speaking on the phone is possible in an opened and closed mode as well. Even more, there is a possibility to set a slider active when opening and assign finishing all the operations or their continuation to closing the phone. The second variant is not customary, for instance, you speak on the phone and then close it, the call is not finished. There is a need in this mode for those who often use different functions during a conversation (SMS, a note book, organizer) but don't like speaking on the opened phone. One more advantage is keeping a current menu when closing the device in the standby mode. There is an automatic key lock in the phone. It snaps into action on closing the slider (may be turned off). The majority of the functions is available using functional keys, there is no need in opening the phone. When dialing a number from the phone book opening the device will be necessary only when typing in the information. The screen is 262K and has the resolution of 176x220 pixels. 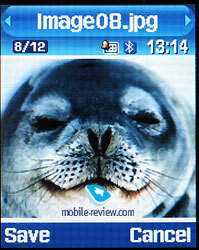 Models by Samsung always differ from the rivals in the quality of the screen and only to the better. The colours are bright and vivid and the display is much better than the screens by other manufacturers (the only exception is Sharp and models by Motorola equipped with such screens). The quality of the screen has no analogs in its class and even Siemens SL65 differs in the quality of the picture much. 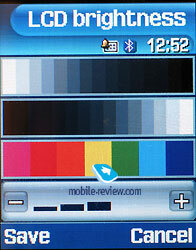 Comparison with Motorola v620 showed no any difference, colours, brightness are close and comparable. 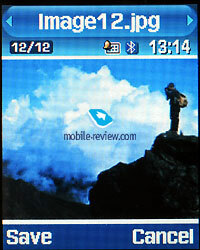 The TFT screen behaves well in the sun and the picture is seen. 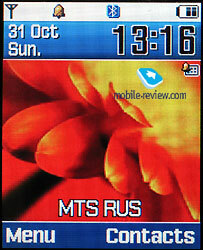 Digital clock is displayed on the screen in the standby mode, it serves as a screen saver. A navi button is four-positional with an integrated OK button and it also serves for access to a wap-browser from the standby mode. The OK button was present in a number of models but was not indicated, evidently that made users doubt. Functional keys are comfortable and well-disposed. Number keypad is comfortable also, a backlighting is white and characters are seen in various conditions. In difference to other models of this form-factor by Samsung there are no troubles in working with the upper key row of the number keypad. The slant of the upper part is comfortable and a finger doesn't touch the body. There is a coupled volume level button on the left side surface and an IrDA gap may be seen a bit lower. Speaking in advance I'd like to point out that is the first time that the IrDA works fully in a phone by Samsung. 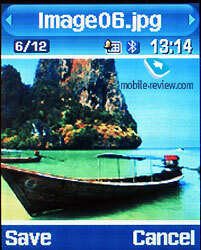 No any software for a PC is needed and files may be transmitted from one phone to another just simpliciter. 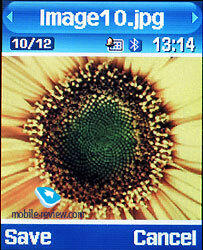 All the file formats that the phone "understands" are supported. 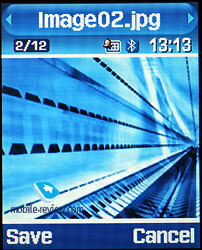 If to rename a file into JPEG the phone will receive it and then the file may be transferred (using the phone for transporting files). 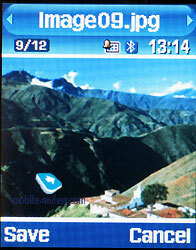 There is a digital camera access button on the right side surface and a connector for a handsfree headset a bit higher. The connector is miniUSB and a stereo headset is included into a package. The disadvantage of the headset is that it is silvery and makes contrast with a black phone. SoundMate accessory is included into the package (but not for all the countries). The accessory resembles a small pyramid matching the phone in appearance. It may be fixed to the phone with a strip. Has anybody guessed the function of a SoundMate? The function is plain, this is an external loudspeaker. 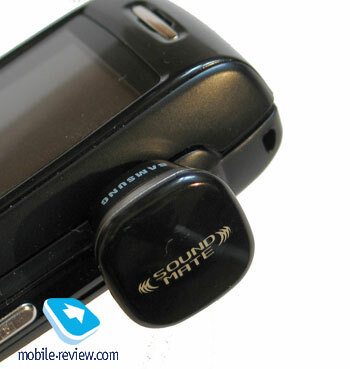 The function of a loudspeaker is already realized in the phone and SoundMate expends its capabilities. Subjectively the sound gets twice louder, there is no need in setting the device in the menu, it's enough to plug it and it will start working. It's curious that playing MP3 melodies in the loudspeaker mode with SoundMate turns the device into a small musical center. There is only one disadvantage, the battery discharges much faster. Thus two hours of listening to the mp3 player discharges the battery almost completely. In the talk mode working time gets about one third less. 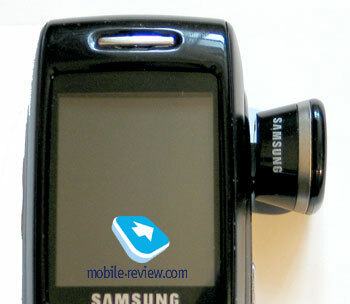 The accessory is capable of working with any model by Samsung equipped with a miniUSB connector (for instance, Samsung E630). It will be sold separately for other models in Russia. The expected price is about 10 USD. The battery in this model serves as a back panel and this is the first time that the company applied a separate fixing device for the battery. You see the fixing mechanism on the top, it's enough to press it and pull the battery. The battery is Li-Pol 850 mAh. According to the manufacturer it works for 220 hours in the standby mode and up to 3 hours in the talk mode. All the documents tell about a Li-Ion battery and there is a note that it is Li-Pol on the battery itself. In Moscow the device worked for about 3 days in case of 50 minutes of talk time and 20 minutes of using other functions (an alarm clock, the camera, organizer). In case you use Bluetooth permanently the working time will be one day (30 minutes of talk time and 25 minutes of other functions). I admit that discharging the battery completely in a day is hard, even those who speak much and use the majority of the functions will be satisfied. In average it is possible to say that the working time will be about 2 - 3 days for the majority of users. Full charging takes not more than 2 hours. 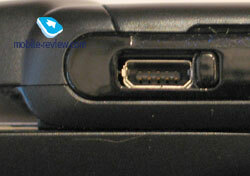 An interface connector may be seen on the bottom end of the phone, and it is similar to the previous models.